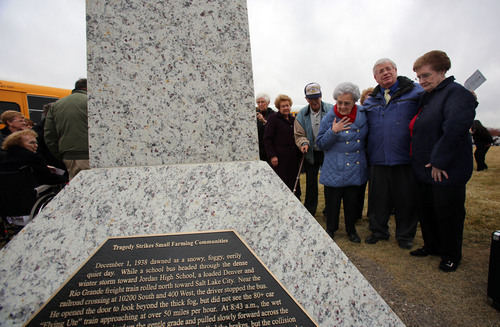 Memorial • Utah city unveils monument to 24 killed in tragic Dec. 1, 1938, accident. Francisco Kjolseth | The Salt Lake Tribune Wanda Shields Naylor, with a hand on her chest, is joined by Lamar Mabey and Joyce Nelson Holder at the unveiling ceremony at Heritage Park in South Jordan for a 75th anniversary of the Dec. 1, 1938, school bus/train crash accident that killed 26 people, including 25 students. All three were directly impacted by the tragedy. 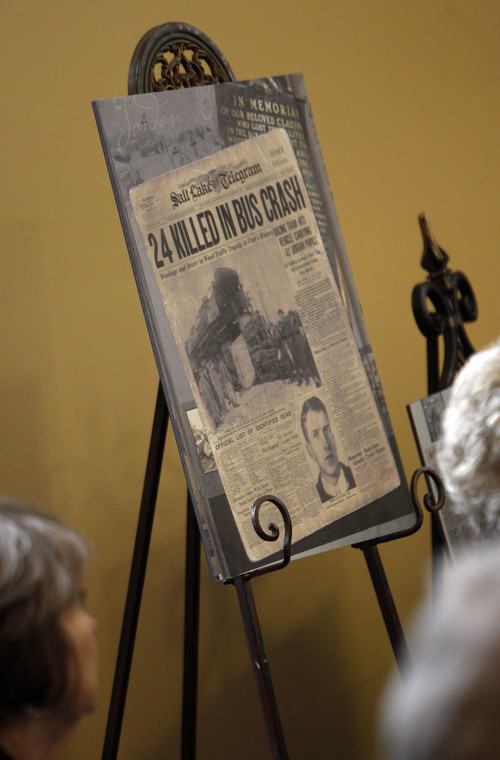 Francisco Kjolseth | The Salt Lake Tribune Old newspaper clippings tell the tragic story as friends, family and relatives gather at Heritage Park Community Center in South Jordan for a 75th anniversary unveiling ceremony dedicated to a Dec. 1, 1938, school bus/train crash accident that killed 26 people, including 25 students. Francisco Kjolseth | The Salt Lake Tribune Friends, family and relatives gather at Heritage Park in South Jordan for a 75th anniversary unveiling ceremony dedicated to a Dec. 1, 1938, school bus/train crash accident that killed 26 people, including 25 students. 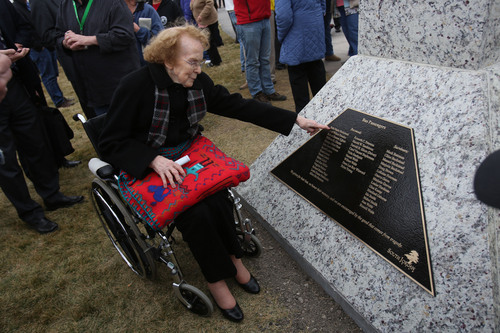 Francisco Kjolseth | The Salt Lake Tribune LaRoyce Fisher, 89, touches her sister's name at Heritage Park in South Jordan for the 75th anniversary unveiling ceremony dedicated to a Dec. 1, 1938, school bus/train crash accident that killed 26 people, including 25 students. Fisher lost her sister Rela Marie Beckstead in the accident. Francisco Kjolseth | The Salt Lake Tribune Roland Blaine Page was only 17 when tragedy struck as friends, family and relatives gather at Heritage Park community center in South Jordan for a 75th anniversary unveiling ceremony outside dedicated to a Dec. 1, 1938, school bus/train crash accident that killed 26 people, including 25 students. Francisco Kjolseth | The Salt Lake Tribune Mark Petersen who's family has a long history of educators in the Jordan School District, bows his head as he remembers a relative killed in a tragic accident on Dec. 1, 1938, in a school bus/train crash accident that killed 26 people, including 25 students. On Monday, Dec. 2, 2013, a memorial was unveiled at Heritage Park in South Jordan to remember those who were killed and those who survived. 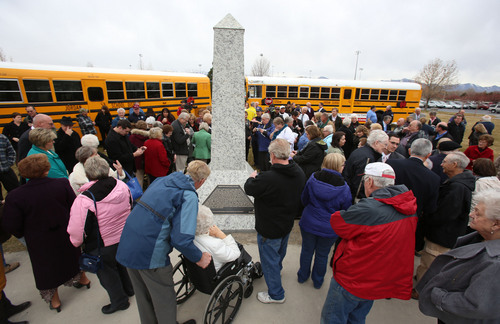 Francisco Kjolseth | The Salt Lake Tribune Friends, family and relatives gather at Heritage Park in South Jordan for a 75th anniversary unveiling ceremony dedicated to a Dec. 1, 1938, school bus/train crash accident that killed 26 people, including 25 students. 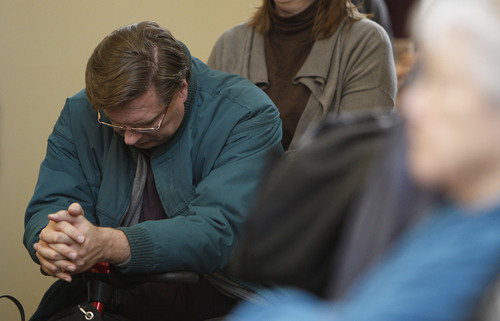 Francisco Kjolseth | The Salt Lake Tribune Sherrie Silcox, daughter-in-law to Farrold H. Silcox who was the bus driver of a tragic accident 75-years ago, wipes away tears as she remembers the tragedy alongside many others. 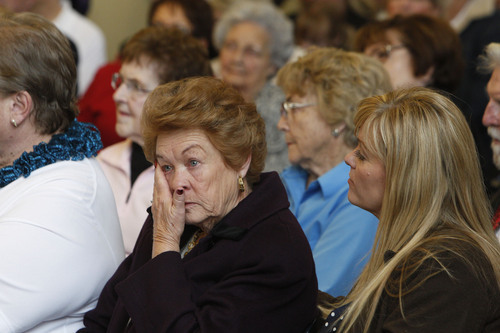 Family, friends and relatives gathered at Heritage Park Community Center in South Jordan for a 75th anniversary unveiling ceremony dedicated to the Dec. 1, 1938, school bus/train crash accident that killed 26 people, including 25 students. 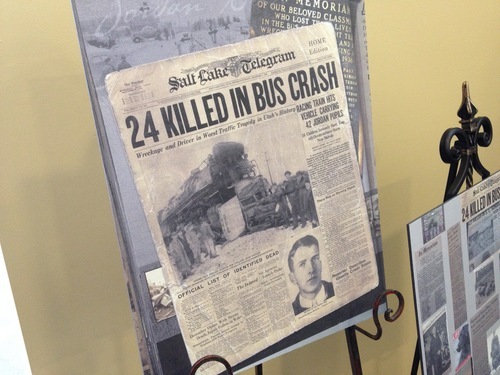 Francisco Kjolseth | The Salt Lake Tribune South Jordan unveiled a memorial Monday at the South Jordan Community Center/Heritage Park commemorating the 75th anniversary of a train/school bus collision that killed 23 Jordan High School students and the driver of the bus. South Jordan • Wanda Shields nearly died. 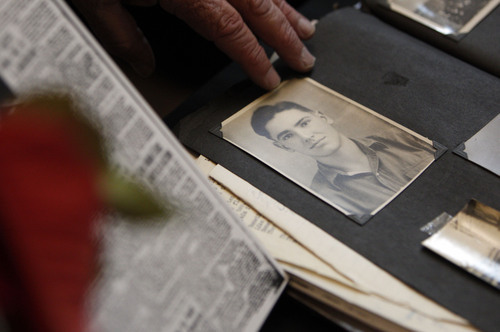 On Nov. 30, 1938, Shields had planned to leave Jordan High School and spend the night at a friend&apos;s home. Shields, now silver-haired and with delicate hands that trembled gently in the cool wind, said Monday that she and her friend would have ridden the bus back to school the next morning. It was something the teenage girls had done many times before, but when Shields&apos; mother called, they gave up on the sleepover. "My little sister got sick and my mother needed me at home," she recalled. The last minute change-of-plans saved Shields&apos; life. The next morning, Dec. 1, the bus Shields would have taken from her friend&apos;s home rolled to a stop at a railroad crossing at 10200 South and 400 West in South Jordan during the first snowstorm of the year. The bus driver opened his doors to look for a train but saw nothing in the thick fog. The driver pulled onto the tracks at 8:34 a.m.
At the same moment, an 80-plus car "Flying Ute" train emerged from the storm traveling more than 50 miles per hour. The engineers slammed on the brakes, but it was too late  the train plowed into the bus. The collision killed 23 students and the bus driver. Newspaper images of the accident show mangled metal twisted beyond recognition around the front of the freight train, which was operated by the Denver and Rio Grande Railroad. Shields  who later married and changed her last name to Naylor  knew everyone on the doomed bus. Monday afternoon, Shields stood outside the South Jordan Community Center and, along with others connected to the accident, pulled a sheet off a white marble obelisk. 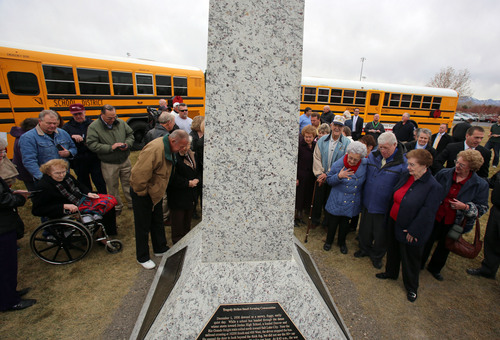 The monument is dedicated to those who were involved in the 1938 train accident and was dedicated during a ceremony attended by about 200 people  nearly twice as many as expected. At the monument&apos;s base, a bronze plaque listed the names of all 24 victims, as well as the 15 survivors. Roland Blaine Page&apos;s name appears near the bottom of the victim list. Page was 17-years-old in 1938 and was catching the bus to school, according to his brother Noel, who also attended Monday&apos;s unveiling. Page&apos;s cousin wanted to "sluff," or skip school that day, but Page wouldn&apos;t do it. Instead, he boarded the bus and never came home. Later that same morning, both Noel Page and Shields learned of the accident. Noel, who was 12 years old at the time, said school was cancelled. Shields recalled that at her school, the principal called everyone into the auditorium, said there had been a terrible crash and dismissed all the students. At the time, Shields didn&apos;t know how many people had died, but as she stood outside waiting for her bus home, ambulances from all over Salt Lake valley began passing. They were driving slowly, without lights and sirens. Shields knew they were carrying the bodies of her dead classmates. The accident haunted the survivors for the rest of their lives. LaMar Mabey said at Monday&apos;s event that his mother, Ann Webb, was told she would never walk again. Webb persevered and walked out of a hospital after six and a half months, but years later still passed the crash site weeping and in silence. The accident reverberated beyond the community as well. Accounts of the crash appeared in major newspapers all over the U.S. and helped spark a series of new safety protocols for bus-railroad interaction. In the aftermath, features such as railroad crossing arms became common. Buses also were required to stop at rail crossings and open both windows and doors to check for trains. Bus safety features have become a hot topic again in recent months following a series of deadly bus accidents. In November, a driver died in West Jordan when his bus  which was carrying no students  collided with an industrial truck that ran a red light. The accident came less than three weeks after another fatal accident in which a bus driver died and four passengers were injured in a collision on Interstate 80. Those accidents happened even as safety advocates were arguing that features such as seat belts should be standard on buses. Advocates believe hundreds of people have been killed or injured in the 45 years since the National Transportation Safety Board first recommended added safety features on buses. Federal investigators also said in reports released last month that inspectors have failed to properly respond to red flags indicating safety concerns on buses in several states. But as advocates and government agencies battle over future bus safety, attendees of Monday&apos;s unveiling reflected on the past. Don Tingey, South Jordan director of communications, said the memorial project was paid for by the city and cost about $50,000. It was approved by the city council earlier this year, after many years in development. The obelisk was designed by architect Joey Clegg. The city&apos;s historical committee researched and compiled the information for the plaques and ceremony. Mabey said after the ceremony that the timing  the 75th anniversary of the accident  was right for the memorial and called the site "a fantastic thing" that would help future generations remember what happened. Shields added that new monument is wonderful way to remember the victims who, she said, are now in a better place. "It&apos;s a cloudy day here but I bet it&apos;s sunny where they are," she said.